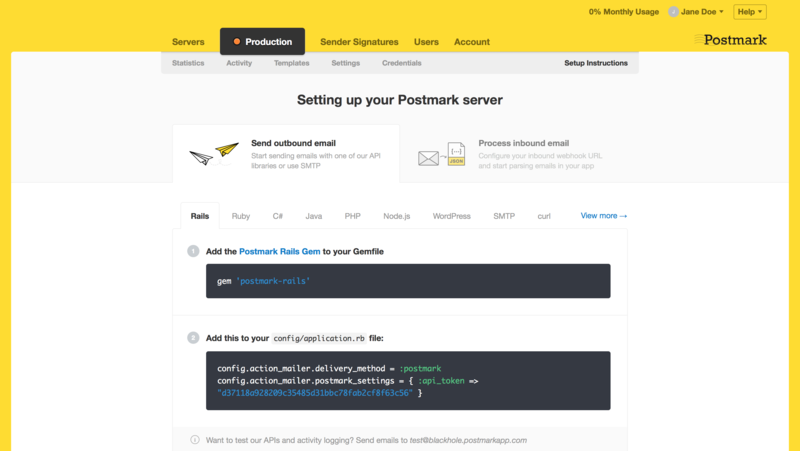 Once you know you’d like to use Postmark, migrating is super-easy. Depending on your desired approach, you can either integrate directly via SMTP settings or use our API and client libraries. Before you begin your migration, it’s important to note that Postmark only supports transactional email. We do not support sending bulk or marketing email, including newsletters or announcements. This is one of the key things that helps ensure your emails get to their destination quickly and reliably. What’s the difference between bulk and transactional email? You’ll need to setup an account. The signup is simple and our free developer plan includes 100 test emails per month. Just visit our account setup page to get started. Once you’ve set up your account, you’ll be greeted by all of our smiling faces and asked to confirm that you’re not sending bulk email or spam. We’ll automatically create your first server so you can get sending quickly. Servers help you organize your emails (inbound or outbound) by project, client, or environments. You can add new servers at any time from the Servers page. In order to send through Postmark you’ll need to have a Sender Signature set up for each address you want to use in the From field of your messages or if you are sending from several or more email addresses on a domain, you can use Domain Verification to verify an entire domain for sending. See our help article here for steps to verify an entire domain for sending. We use Sender Signatures and Domain Verification to ensure you own the mailboxes you want to send from, as this helps prevent spam and abuse. (These safeguards are one of the ways we maintain a great reputation with ISPs and are able to get your emails to the inbox reliably and quickly.) You can have as many Signatures and Verified Domains as you need, there is no limit. Later on, if you need to add more Sender Signatures or Domains, you can add those on the Sender Signatures page. Once you add a Sender Signature, a confirmation email will be sent automatically from Postmark to the email address you added. Unfortunately, these Sender Signature confirmation emails cannot be customized. Once you confirm a Sender Signature, you’ll want to move onto configuring the authentication for the domain. Note that if you proceed with Domain Verification, you will not need to add any more Sender Signatures for that domain since the entire domain will be authorized for sending through Postmark. This will also elimintate any further confirmation emails from needing to be sent. Setting up DKIM and Return-Path authentication isn’t absolutely mandatory to send using a Sender Signature, but we do recommend implementing it to ensure deliverability and security. For Domain Verification, however, it is required that you add a DKIM record to the domain's DNS in order to verify the entire domain for sending. For each domain you add, you will receive a unique DKIM key to add to your DNS. 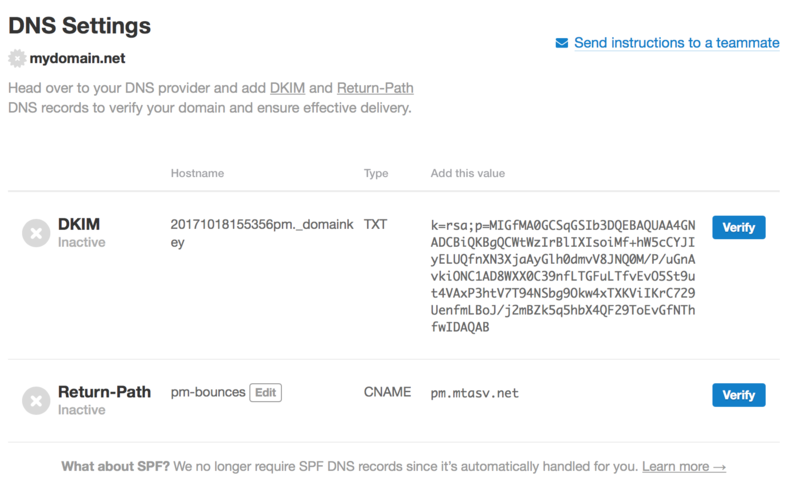 We strongly recommend setting up DKIM and a custom Return-Path to authenticate and protect your domain, even if you are only adding a Sender Signature. DKIM verification and a custom Return-Path for a Sender Signature will also ensure that the Signature's domain builds a solid reputation with ISPs. The DKIM record shown will need to be added to your DNS and then verified using the Verify button after it has been added. For an idea of how to add DKIM records using your specific DNS provider, check out our help articles for different providers. 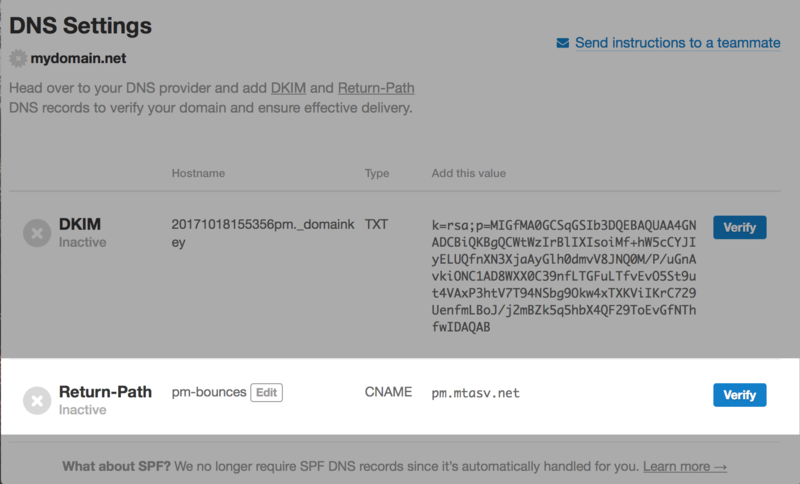 Add a CNAME record to your DNS with value pm.mtasv.net and set the alias to pm-bounces. 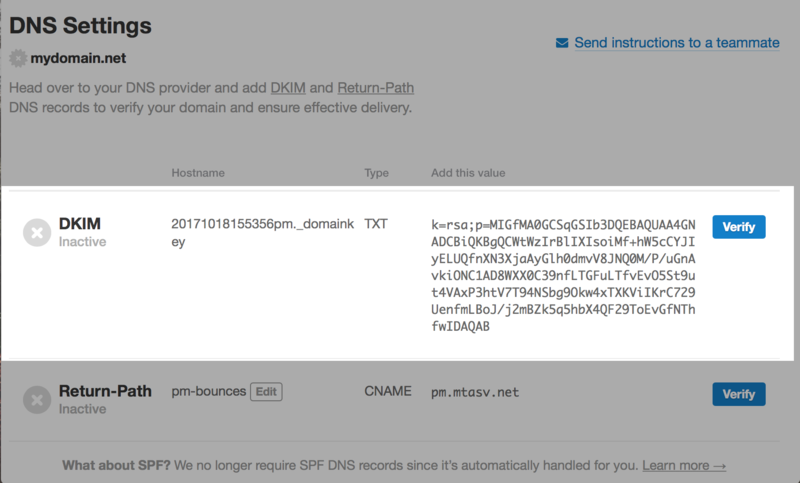 You can change pm-bounces to be anything you wish, just make sure it matches in the Postmark UI and your CNAME record in your DNS. Once everything is configured for email sending bliss, you can make all of the necessary changes in your code. For this, we include several options so you can choose the approach that’s easiest for you. If you’d like to use our API, you can get started with that through our API documentation or you can use one of several official client libraries for Rails, Ruby, .NET, PHP, Node.js, and WordPress. Postmark also has quite a few community-supported client libraries available as well. If you ever have any questions or concerns, we’re just a single live chat, tweet, email, or help doc away. We’re always happy to help, and we know this stuff can be tricky at times. So please don’t hesitate to reach out if there’s anything we can do to make migrating to Postmark easier for you.